Artists line up against mural for a photo. 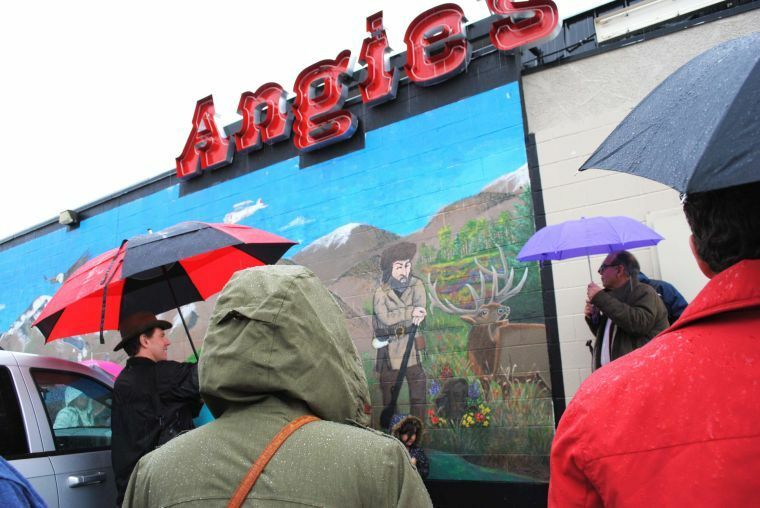 LOGAN – People gathered beneath umbrellas and braved the rain on Saturday for the unveiling of the art mural on the north wall of Angie’s Restaurant. 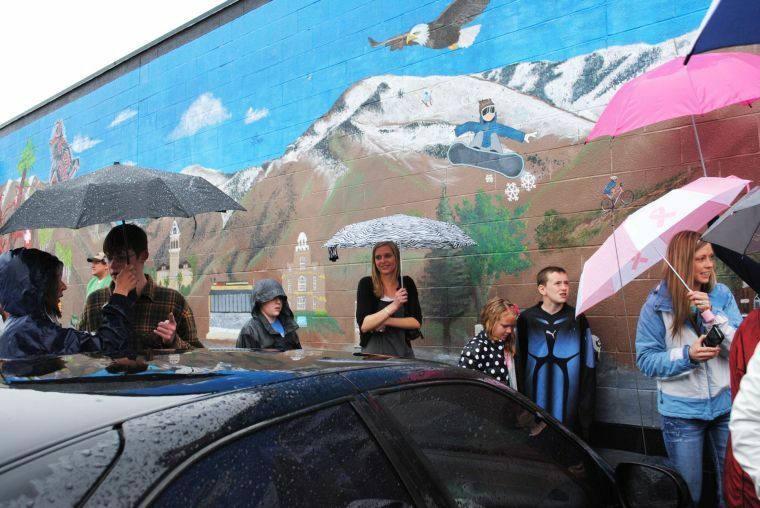 The mural depicts people, places and times of Cache Valley. Old Ephraim the grizzly bear, Jardine Juniper, and the Cache Valley Cruise-In are just a few of the art pieces included in the mural. USU student Matthew Vance came up with the idea for the mural months ago and presented the idea to Angie’s. The artists selected to paint portions of the mural were winners of a contest. After artists submitted their artwork, it was then displayed in the restaurant, and voted on by locals as well as by a panel of judges. The top three artists of each age category were awarded a cash prize and invited to add their artwork to the mural. Allen not only added her own art to the mural, but four of her art students from South Cache placed in the contest as well. “Our school is very proud, and I got to paint with them so that was awesome,” said Allen. Allen painted the Jardine Juniper tree and she had to be on a tall ladder to finish her creation. She said it was hard to paint in the cold and it required more blending techniques. Chatterton entered a painting of an old car on Main Street, but she was asked to paint a church and the Wind Caves on the mural. She said she’d never been to the Wind Caves and didn’t know what they looked like, so she had to do some research on them. Those who placed first in their age division were awarded a $100 cash prize. Second place won $50 and third place won $25. All winners are listed below.